We were beside ourselves with excitement (Graham, Margaret and I) after stumbling across Lily of the Valley at our favorite grocery store in Portland last week. Although very pretty as they were, I thought I'd dress them up a bit for the Easter holiday. Luckily the grocery store also had baskets, so we knew exactly what we'd do when we got home. After lining the basket with plastic for watering, we added a ribbon, a little nest and a layer of moss. 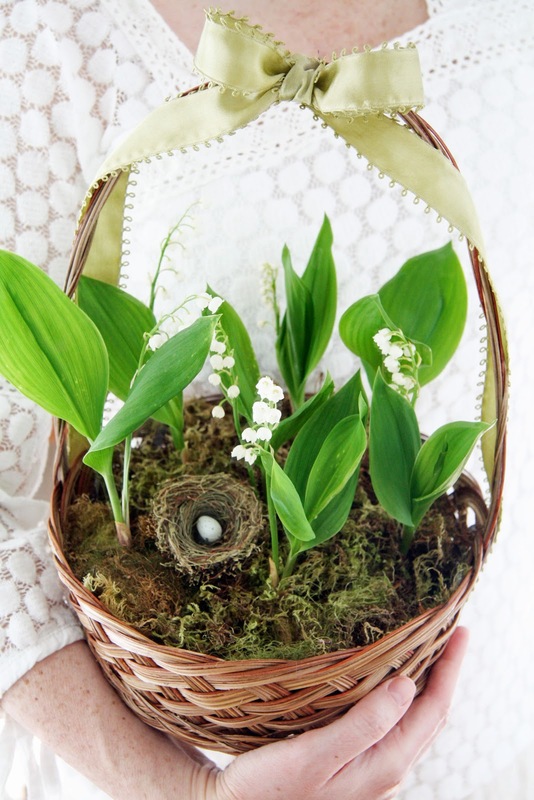 I've always loved live Easter baskets with growing grass or live flowers. However, we agreed (Graham, Margaret and I) that the live basket was a little too grown up for our curious little 15 month-old selves...we still like putting everything into our mouths - whether interesting, pretty or just plain curious. OOohhh what an awesome score! You lucky! I can never EVER find it - and it smells so wonderful! Les Muguets - will always remind me of my mom. Oh, I love lily of the valley! I love how you put them in the basket. I've been trying to grow some from the pips, (I think that's what they're called), but not having much success. I live in Portland and would love to know what store you found them at. As sweet and pretty as sweet and pretty can be! Love the little nest! How pretty! 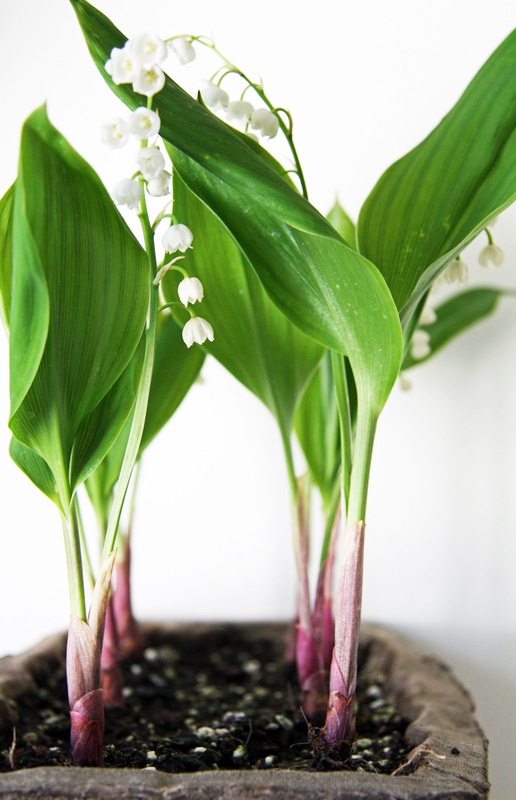 I fondly remember Lily of the Valley growing alongside my grandmother's house on Long Island, NY. When I was four and a half we lived there with her for about 6 months. I vividly recall those flowers -- and the little frogs I used to catch in her yard (and then bring into the house much to grandma's dismay!). I hope you, Mike and the babies have a lovely Easter. Lovely . . . And an additional benefit . . you can plant it outdoors and it will multiply and create a bed of fragrance for you to enjoy year after year. Happy Springtime . . .
Beautiful but VERY poisonous. Make sure the little ones don't climb to taste it. So sweet. In our new garden, there is lot's of lily of the valley jumping up daily. Can't wait for it to bloom. Love lily of the valley but I've never seen it for sale in grocery stores! Linderhof has it's own bed that I treasure! A relic of a past owner. I love the variations of green in the leaves as well as the purple at the base - so pretty. I've got a 20 month old and she's touching and grabbing even more now that she can reach countertops and such. I'm a new reader and found you through Red Door Home. My favorite flower! I can't wait for mine to bloom! I miss lilies of the valley too ! Lily of the Valley is so romantic. It makes me feel like I stepped back in time. My very favorite small flower. And the smell is out of this world, as you know. I was given a small pot of about 5 plants many years ago, planted the pips in moist partly sunny spot once they'd finished flowering and now enjoy a huge patch of them every spring. I snip the flowers and display them in a number of sterling bud vases, which I collect. Spring has so many wonderful gifts. Thank you for this post. I was just thinking about the Lily of the Valley that grows at my parent's house that we sold last December. I looked forward to seeing, and smelling them every year, so to not be able to visit them this year has been tough. Seeing your beautiful images just reminds me that the new owners will now be enjoying them and that makes me happy! A favorite flower...muget de bois...love how you festooned it! Precious! I'm over from Red Door and am so happy to be a new follower! What a perfect Easter basket! Love the little nest. 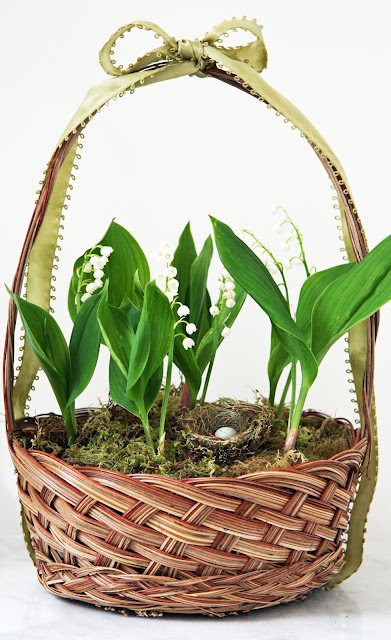 Here in Austria we have to be careful when it's springtime and we want to gather wild ramsons, because the leaves look so much like those of the lily of the valley. I love the little nest tucked in there. So sweet. My absolute favorite...until the lilacs bloom. A debate we have every year- which ones smell the best! I love the color contrast of the white and vivid green. Also did you hear that Portland was voted the "greenest city" Congrats! I'll be a 95 years old and the scent of Lily of the Valley will take me back 90 years to my grandmother's arms. Lilies of the Valley remind me of my grandmother. she had a row along the north side of her house. When they were blooming, she wore a sprig of them pinned on her apron. Thank you for sharing your photos and thoughts! Yes, each May 1 the French give one another a sprig or small bunch of it. It is isold on the streets by small vendor carts. It is definitely a sign of spring; delicate fragrant, and ethereal. Unfortunately it does not last long, and is somewhat poisonous-so watch the kiddies around it. I know in some states Lily of the Valley is considered an invasive, but here in southern California you don't see it because it's too hot and dry to really take. So it is a treat to see your lovely basket, which I can practically smell! loved this post. It made me very happy that I naturalized the back of my home with lilly of the valley. I will have to recreate the lovely basket when mine springs forth! This is just so darling, and your photos are soooo beautiful. I just came over to your blog for the first time from Modobject at Home. This is so lovely! I would like to try a live growing basket one year. Wonderful idea! I shop at New Seasons. They have several stores in the Portland area and they're all great! All the antique stores (Sellwood area, on Starks...) are wonderful. Stars is in Sellwood but there are many more stores there...Monticello is on Starks and it's a favorite of mine too.